Where to Buy Ovation Miticide, Ovation SC Miticide - 16 Oz - $284.95 for Sale with Fast Free Shipping! 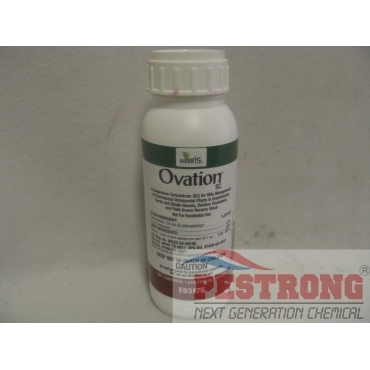 Ovation SC Miticide - 16 Oz contains clofentezine is a suspension concentrate for commercial use on ornamental plants grown in greenhouses and outdoors. Ovation SC is recommended for use on ornamental plants (including, but not limited to, conifers and non-bearing trees and vines, carnations, chrysanthemums, dieffenbachia, geraniums, impatiens, hydrangeas, potentillas, scheffleras, and roses), in greenhouses, saran and shade houses, outdoor container, and field-grown nursery stock for management of plant-feeding mites. Ovation SC is highly active on mite eggs and early mite stages. It has shown activity and persistence up to 45 days after application. Proper timing of application, based on the utilization of scouting may delay or eliminate the need for subsequent applications of other miticides. It is an excellent tool for growers to use in their mite resistance management program. No effect on beneficial insects, particularly predatory mites. It can be effectively used in IPM programs employing beneficial insects. This Ovation SC has been discontinued & replaced by NOTAVO miticide from OHP Brand. This works great and is very effective against mites. I use such a small amount and it takes care of such a wide area. I really like this.